Updates to Kirstin's profile since your last visit are highlighted in yellow. You may remember I was an exchange student from Australia. My year in America was one of the most wonderful years in my life. The distance, however, means I live far away from some people with whom I became very close and I have lost touch. After going down a few roads (science and real estate) I completed a business degree and moved from Melbourne to Sydney for about 8 years. I began working in marketing and have been in this field ever since. I enjoy the work, although feel I'd like to do some radically different - just not sure what that is. I returned to Melbourne (my home town) about 7 years ago and love it. 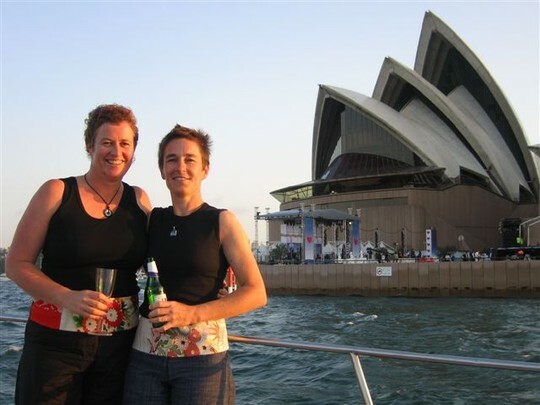 I met my wonderful partner Jill not long after that. I'm still skiing as much as I can, although our seasons are a bit up and down. We love travelling, but with a couple of very old dogs we've been remaining close to home lately. In saying that though, I've just received an email from the lovely Jean Hamlin, telling me about the reunion and I'm going to see what we can do to try and get over. Kirstin Smith has a birthday today. With my dad, Jill and Max, one of our dogs. 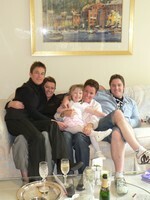 Christmas with Jill, my niece Charlotte, my sister Kylie and brother Cam.